Do a quick google search for “aspartame,” and we can guarantee that the results will take you literally days to wade through. We wanted to look at the folks who keep telling us that it’s safe: the so called 'experts'. 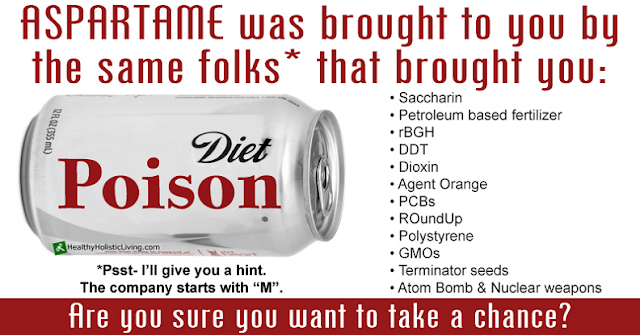 Experts in the government, medical field, the people who keep patting us on the head and telling us not to worry, that if aspartame was dangerous, they’d tell us. Being skeptics has never helped. The more someone pats you on the head, the more you start looking for something up their sleeve. Let us be clear: We have been deceived about the safety of a dangerous product, and all in the name of corporate profits. Where did aspartame come from? It was first developed by the pharmaceutical company G.D. Searle. But Searle had difficulty getting their product approved by the Food and Drug Administration, the federal agency responsible for making sure our food and drugs are safe: Apparently, the monkeys and mice the substance was tested on developed brain lesions, tumors, and seizures, and even died from it. 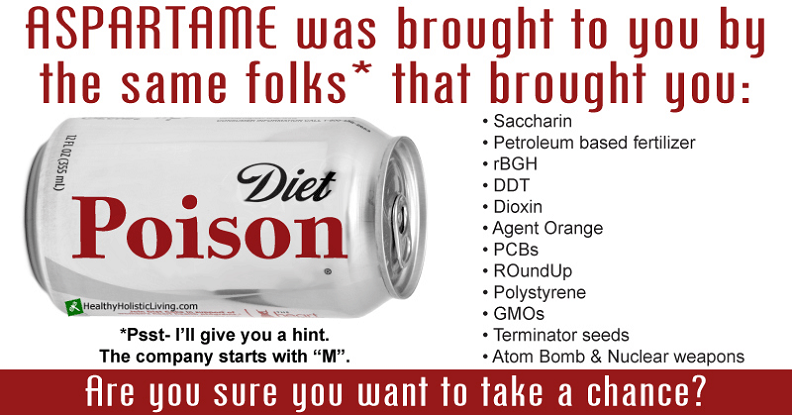 When it looked like aspartame would be approved later on for use in carbonated beverages, the National Soft Drink Association itself objected, saying it wouldn’t be safe because aspartame is very unstable in liquid form and breaks down into, among other things, formaldehyde. Monsanto bought G.D. Searle and Co. in 1985, and the NutraSweet Company operated as part of Monsanto until 2000, when Monsanto sold it to J.W. Childs Equity Partners, where it remains today. In that section, the ARC says, “The Aspartame Information Center Expert Medical Advisory Board was created to help guide the Center’s communications to health professionals and the public about aspartame benefits, safety and role in a healthy diet. So how do you know if a product contains aspartame? The Aspartame Resource Center says simply looking at the ingredient list will tell you if the product contains aspartame, and indeed, the FDA requires that aspartame be listed on the label. Right, that ARC, that FDA. But just in case a company hasn’t listed it, if the label mentions “phenylalanine” at all, which is a component of aspartame, then the product contains aspartame.